Green Procurement & SDS | TOKUSHU KINZOKU EXCEL CO.,LTD. If you need precision metal materials, you need Tokushu Kinzoku Excel Co., Ltd.
To manage environmentally harmful substances, we have stipulated a list of prohibited chemical substances, and check that prohibited substances are not contained in the materials and indirect materials we purchase. 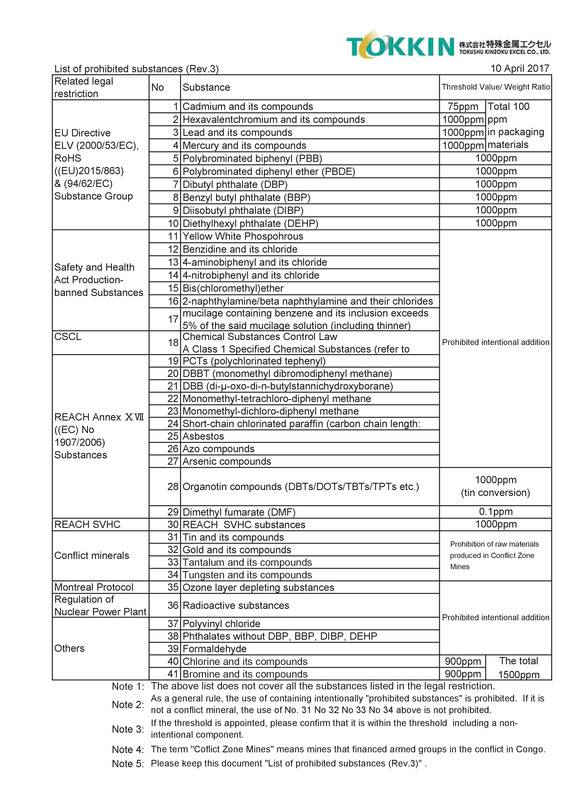 In April 2017, we added these prohibited substances to our List of prohibited substances (Rev.3). These changes were made in order to reflect revisions to national and international law (Act on the Evaluation of Chemical Substances and Regulation of Their Manufacture, RoHS2.0, REACH, Conflict Minerals etc.) and to add information regarding frequently requested substances. Material safety data sheets (SDSs) are provided to all customers who purchase a Tokkin product. (1) Asking a sales representative. Material safety data sheets are available for the majority of materials we supply. We are also happy to provide ICP data, parameter sheets, and similar information. Contact us for details. We accept requests for consultations, quotes, and other inquiries regarding Tokkin products. Copyright©2014 TOKUSHU KINZOKU EXCEL CO.,LTD.